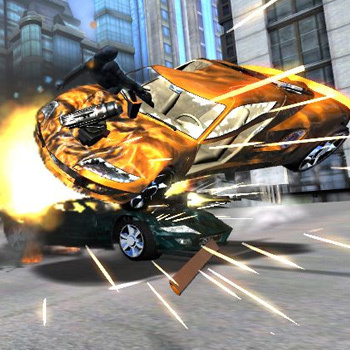 Full Auto 2: Battlelines puts high-speed vehicles outfitted with weapons and armor into fully realized and fully destructible urban street environments. Fierce combat-racing will ensue as you strategically use destruction to win races as well as leave massive devastation in your wake. Players can destroy the environment to dynamically change track conditions to block competitors, open new paths, or crush opponents with falling debris caused by well-timed missiles. Full Auto 2: Battlelines also introduces a new Arena Mode featuring team play and six different levels, each specifically designed for a unique type of multiplayer car combat. In the new multi-path single player campaign, players battle to take control of Staunton City by conquering the six different districts and taking control of opponent cars and weapons. The game's six different carnage-filled multiplayer modes, which incorporate team play and objectives ranging from classic deathmatches to unique base assaults and gladiator-style gameplay, deliver a diverse range of competitive options. The sequel implements the fan-favorite Unwreck feature, which allows players to turn back time and take another shot at a treacherous turn, avoid a deadly obstacle, or simply avoid enemy fire.